The trade press is reporting that a majority of shares of Ports America may be acquired by a corporation in Turkey, Yilport Holding Inc. The Istanbul-based corporation is part of a multi-industry holding company, its owner also a major investor in the French CMA CGM container shipping line, acknowledged the talks are occurring. Taking control of a major US terminal organization with around 40 operations around the country, would be a big move as compared to the UAE-based Gulftainer’s purchase of a small container terminal at Port Canaveral a few years back. A better, if not perfect, analogy of a Mideast-based business making a move on a US MTO/stevedore would be the ill-fated move by DP World in 2006 to take over P&O Ports. At a time when American port security in a post-2001 world was still a very active subject in Washington the credible Dubai Ports World ran afoul of Chuck Schumer (D-NY) and others of both parties in Congress, including then-Senator Hillary Clinton (D-NY). Claims were made that it was a potential foot-in-the-door by a state-owned organization from a region that sponsored terrorism. The rhetoric was hot. The subject was raw meat for never-too-tired-to-talk radio. A second, unfortunate casualty of the blowup was the Bush administration’s candidate to be Maritime Administrator. The respected David Sanborn had the doubly bad luck of 1) having his nomination considered in the Senate in this same time frame and 2) being an operations executive of — yes, that’s right — DP World. So is this another potential “DP World” should Yilport and Ports America do a deal? Maybe not. Turkey is a member of NATO and a US ally, if not the best kind of ally, and more time has passed since that anxiety-filled first decade. But the situation does invite a recollection of a particularly crazy time here when the marine terminal industry and the international nature of the maritime sector were under the glaring, if not illuminating, lights of official US. What is not especially evident is whether all that attention then led to a greater understanding of the industry today. Folks here are talking about actual weather, not metaphorical meteorology of the sort that can be a useful device when writing about Official Washington rhetoric and policy e.g., windy, hot air, foggy, drought…not to mention the occasional political lightning. The snow starts here during the morning commute on Friday. The Nation’s Capital doesn’t manage heavy snow very well. We’re taking odds on the government sending people home even before they get to work. Get ready to hear spinning tire much of the day and night hours, and see sidewalks whose residents wouldn’t think of getting ankle deep in the wet stuff to shovel when the sun will eventually do it for you. (Wanna bet when the District’s downtown streets finally get plowed?) Ah! Winter in Washington! Then there is the financial storm front, forecast as likely to be of historic dimensions, that has been battering that other center of American power — Wall Street. Instead of snowfalls the headline is “Dow Falls.” The price of oil is sending economic shock waves through new and old producing states and here as well. Speculation has begun that the Federal Reserve will eventually be drawn back into a resumption of quantitative easing policy or some other response that confirms an economy in reverse gear. (You see! Obama is making things worse for American producers by lifting sanctions on Iranian oil.) The multiple committee oversight hearings are inevitable…for starters. Claire McCaskill (D-MO) resorted to using a “hammer and sickle” reference when talking about Bernie Sanders’s (I-VT) as he grows stronger against her candidate, Hillary Clinton…who sent her daughter out to make specious claims against Sanders and worked the other end of the spectrum by suggesting that the Brooklyn-born Sanders is reliably doing NRA’s bidding. (Did she actually say that!) The patently silly talking point — to which Sanders responded by proudly pointing to his D- grade on the NRA report card — put quizzical faces on half the bronzes in Statuary Hall. Then there is Donald Trump who yesterday said that there could be a place in his administration for Sarah Palin. Occasionally I stray from strictly MTS matters. An historic appearance by the Bishop of Rome before a joint session of Congress–Mons Vaticanus to Capitol Hill–is as good an excuse as any to stray. Today Pope Francis arrives in Washington. The advance logistics resemble those for presidential inaugurations. Security and transportation implications (“get ready for some epic traffic jams!”), with visitors in the hundreds of thousands predicted, are such that I and many others will be somewhere other than in the District of Columbia for the remainder of the week. Roll Call reports (“Members Will Be Blocked 2 Ways From Touching Pope Francis”) that “[O]ver-the-top precautions are a reflection of the unique protocol, security and political concerns attendant to the first papal address to a joint meeting of Congress. It has come to resemble a state visit, State of the Union address and presidential inaugural rolled into one.” The U.S. Office of Personnel Management has reassured us that the “Federal Government in the Washington, DC, area will remain ‘OPEN’ during these 3 days” but “to help alleviate traffic congestion and minimize distraction to law enforcement and security officials, agencies are urged to permit employees to use their workplace flexibility options,” such as teleworking. The pope’s deep footprints will be left all around town — on the Hill, at the White House, in the NW sector where he will reside, and in places of worship for the faithful and of shelter for the homeless. Whether you are an observant Roman Catholic or not, Pope Francis’s visit here will be something to see, if only on the screen at home. How will this significant and inspiring religious figure affect the significant and sometimes uninspiring (and secular, politically speaking) elite of this town? The political press have an opinion, of course. Yes, the GOP leadership’s focus on Planned Parenthood funding neatly coincides with his visit but the pope, whose schedule includes spending time with the have-not population in this town, also will be associated by the Dems with their present push to ease the 2011 budget caps on non-defense spending including programs to help the disadvantaged. Pope Francis, who said in 2013 that “a good Catholic meddles in politics,” also issued an encyclical about man’s contribution to global warming, endorsed the Iran nuclear deal, and announced that Cuba would be his last stop before the US — all since Speaker John Boehner (R-OH), a Catholic, made the invitation to address Congress. Ultimately, Washington is the nation’s political capital and so among the many thousands of the faithful who are expected to be here this week will be The Politician. We will see both parties’ selective scoring of the pope’s visit and we will watch Capitol Hill — and the president — make whatever they want out of the historic visit. Some assessments are already being heard and, judging by the reports, Republicans are especially quotable. “I think we know the pope’s views on [abortion] and he’s right in that instance,” said Senate Majority Whip John Cornyn (R-TX). “When the pope chooses to act and talk like a leftist politician [with respect to climate change], then he can expect to be treated like one,” wrote Paul Gosar (R-AZ), who said he will boycott the address. Last Friday was a somber day of steady rain as New Jersey Senator Frank Lautenberg was buried at Arlington National Cemetery. News reports this past week cited how his passing was notable because he was the last sitting senator of the “greatest generation,” that chamber’s last veteran of World War II. His death came just months after Hawaii’s Senator Daniel Inouye, a wounded veteran of that war, took his resting place among the nation’s noted military and civilian leaders at Arlington. It need be said that Senator Lautenberg’s death on June 3, also is notable because it marked the passing of a champion of Federal policy to making communities healthier, the environment cleaner, and industry and travel safer and better. It was a personal agenda well suited to his home State of New Jersey but carried out with no less than the nation in mind. In his 28 years as a senator he served on virtually every committee and subcommittee that touched on authorizing and funding transportation, civil works and environmental policy. For a period he chaired the Transportation Subcommittee on Appropriations while as a senior member of the Environment & Public Works Committee (EPW). For a few years after the attack of September 2001 he also was on the Homeland Security & Governmental Affairs Committee. In recent years he chaired the Surface Transportation and Merchant Marine, Infrastructure, Safety and Security Subcommittee of the Senate Commerce, Science & Transportation Committee (CST). In recent years he served on EPW, CST and Appropriations, including the Corps funding subcommittee, concurrently. As was evident in his committee work his approach to legislating was to cover all the bases, or at least as many as he could. He championed improving airports and the aviation system, expanding the use of transit and passenger rail, modernizing freight transportation, bringing American port infrastructure to world standards, and securing them all from the those who would do us harm. He was appointed to the President’s Commission on Aviation Security and Terrorism after the tragic downing of Pan Am Flight 103 over Lockerbie, Scotland, and returned to the Senate, after a two-year hiatus, to help write and oversee anti-terrorism law after the downing of the World Trade Center towers. In those towers he had served on the Board of Commissioners of the Port Authority of New York & New Jersey before being elected senator in 1982. His time with the Port Authority–and his building the Automatic Data Processing Corporation (ADP) from scratch–were credits on his resume in which he took great pride and enjoyed telling people about if the occasion would allow. 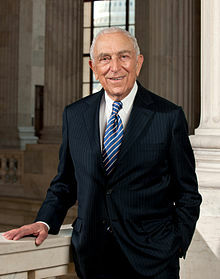 Frank Lautenberg put much effort into environmental issues. He gave his attention to the recovery of old industrial wastelands through brownfields initiatives and Superfund legislation and to making the Toxic Substances Control Act more effective. He was protecting the coastline whether the recreation beaches or the nurturing marshlands. In his last year he walked the Jersey Shore in the wake of Superstorm Sandy, secured bi-partisan support for his toxic substances legislation and, from his wheel chair, cast his final vote in support of tighter gun legislation. He was a tough fellow and could be an relentless advocate. Just ask the trucking industry that couldn’t budge him from the centerline where he stood in the way of increasing truck size and weight limits year after year after year. Ask the FAA whose employees’ merit increases were at risk while their work was incomplete on the redesign of East Coast airspace in the Newark/LaGuardia/JFK market. Ask Norfolk Southern and CSX who found the Senator immovable on key issues pertaining to assuring competitive rail service for his home port when Conrail’s assets were on the block. Was he always the advocate that some of us wanted him to be? No, but then you rarely find a senator who is that agreeable. Cast: Persons who come to positions in government to make a point and others who come to govern. Neither conservatives nor liberals alone are cast as good at governing. Forward: Some like wielding power but their interest wanes when it comes to the nuisance of making government function well. Governing can get in the way of principles, pledges and making points. For some, government isn’t complicated; it’s just in the way. It’s the root of all ailments. They reach for the lancet with no less confidence as to the result than did medical men whose all-purpose remedy was to bleed the patient. Governing is not always done well, which makes it easier for the talented among the electeds and civil servants to stand out. I. The urge to rant about the needlessly protracted debt ceiling decision-making is resisted here. Today Congress finally sent “the deal” to the White House. There is little evidence of the art of politics; instead we witness the game of brinkmanship. Think playing chicken on a narrow country road. In the the driver’s seat are persons with an unswerving belief in what government shouldn’t be and a disinterest in the map of governance. (They also sign a pledge to drive the car without benefit of headlights.) They would just as soon call people names than to the negotiation table. That some people did come to town to be Governers may be what eventually pulls our national fanny out of the fire but one fears that the flames will burn hot for a good while longer. Governers brought about the Simpson-Bowles fiscal reform commission, sweated over the details of its report, and were prepared to act on that report. Governers tried to make the “Biden negotiations” work…and didn’t walk out. Governers make up the Senate’s bipartisan “Gang of Six.” Whatever terms of agreement over fiscal policy to emerge from the fire over the next year will be founded in such efforts. II. The House panel that held longest to a bipartisan spirit in an era of increasing rancor is the Transportation and Infrastructure Committee. Road projects know no party as the saying goes. In July, Chairman John Mica (R-FL) released the highlights of his planned surface transportation bill. It read much as he said it would. Reforms, consolidations, and reined-in spending to match reduced Highway Trust Fund revenue. It is based on harsh reality and a tax-averse party caucus. That interest groups responded with concerns about program eliminations and slashed funding was hardly surprising but the response from Mica’s Democratic counterpart was. Nick Rahall’s (D-WV) sharp words may not sound unusual in today’s Washington but observers noted the change for a committee where the chair and ranking member stand together on most things and respectfully disagree on the rest. In the last scene is the Federal Aviation Administration bill. Mr. Mica takes on both House Democrats and Senate counterparts of both parties over disputed issues in the long unresolved bill that authorizes funding for aviation programs. He put a provocative provision in the House-passed extension and dared the Senate to not approve it. It didn’t. As Congress beats it out of town for the August recess this other Capitol stand-off leaves USDOT holding the bag with 4,000 non-critical FAA staff forced to stay home and contractors around the country ordered to stop work on airport projects. III. Not without reason many States are concerned, even alarmed, at the damage that can be done by non-indigenous invasive species. Great Lakes States have a long history of struggling with what can arrive in vessel ballast water. But what concerns certain regions of the country also concerns the United States and other nations. Solutions to an international problem carried in the tanks of global shipping rightly belong to Washington and the International Maritime Organization. A patchwork of regulation at the State level is opposed by the maritime community that values uniform rules from port to port. Governor Andrew Cuomo and his environmental commissioner inherited the DEC requirement that the agency regulators have insisted on despite all reasoned arguments and documented findings to the contrary. Those regulators made individual vessel operators–a thousand?–apply for an extension of the implementation date so they would not have to meet the un-meetable standard. They were held in suspense until February 2011, beyond the implementation date, when DEC finally sent out letters of extension. Most recently, Steve LaTourette (R-OH) decided that New York was not taking the concerns of others seriously. So he did something to get Albany’s attention. You’d think that Congress and the Administration are proud of SAFETEA-LU. That’s the “bridge-to-nowhere”, 6000+ earmark, strangely named measure that was signed into law in 2005 and immediately trashed on the front page of Parade (yes, Parade! ), on editorial pages of all stripes, and by interested interest groups. Freight stakeholders were grossly disappointed by the final product of a seemingly endless process born of a White House that didn’t seem to care, a Congress that seemed to care only about taking home projects, and policy makers who, for the most part, would have stumbled in answering the question: what is the underlying national policy and purpose? In retrospect, the SAFETEA-LU experience was just what the doctor ordered. Like the “Pirates of the Caribbean” franchise that premiered with a ridiculously entertaining first film and epitomized wretched excess by its third iteration, the “TEA” surface transportation bill franchise was not well served in 2005. Time for a change. The National Interest (my caps) was lost in the flood of 6000+ earmarks. The Highway Trust Fund is structurally flawed and is losing revenue. Capital needs of our transportation system are greater than current funding levels. American competitiveness is at risk if we ignore the problems facing a growing goods movement sector. Too many discrete surface transportation programs limit the ability to focus funds on greater needs. Metrics–performance measures–would help judge where Federal investments can have greater effect. So you’d think the policy makers would be in a hurry to fix the problem,get “LU” off the books and put in its place a new stimulus for the lagging economy. It doesn’t help that the public and their electeds are tax-talk shy. That was a main reason why the White House delayed putting together a proposal for a new bill. It is the reason why few in Congress are willing to talk even about adjusting the existing tax in order to plug the gaping hole that is draining the trust fund tank. Formal appeals and press releases by stakeholders calling for action pile high. Reading the signs as to where the key actors may be headed in recommending a 6-year bill…the Administration has budgeted a $556 billion without stepping onto the thin ice of tax talk. The Senate is looking at $339 billion, which will require around $75 billion in undefined additional revenue. The House appears rigidly set in whatever revenue the Highway Trust Fund fairy will collect in fuel and the other excise taxes currently in effect. Like just about everything else in this town, it’s the talk about spending–or silence about revenue–that is governing the legislative agenda. It’s not that key actors don’t want to get a bill written and made law. They really do. They understand the potential for claiming and real job creation. They want to shake off the dust of inaction. They actually want to solve problems. Chairman Barbara Boxer and her Republican counterpart met the press this week. Chairman John Mica frequently and convincingly voices his intent to produce a bill this year. And the President outlined, in greater detail than the others thus far, his policy direction when issuing his FY 2012 budget. There are other signs of what passes for progress in Washington. Freight related bills have been introduced and await movement by the lead committees. However a good many seasoned observers do not expect a bill will be signed into law until after the 2012 election because of tax issue avoidance. A restaurant is moving into our nearby Del Ray Alexandria neighborhood (and not nearly soon enough, I might add). It is unabashedly called Pork Barrel BBQ. The name–chosen by a couple of former Senate staffers now opening their first restaurant–has plenty of context in the Washington area where “pork barrel” is a mud that gets slung by persons of all partisan and ideological stripes deservedly or not. The observation goes…”One man’s pork barrel is another man’s needed project” (or favorite eatery, as the case may be). But let’s reject the term for such time as it takes to rationally debate the issue of earmarking. The previous post on this blog discusses how a broad brush is being used in the “earmark” debate in Congress where schizophrenia has been in great evidence as party members opine on the subject of how earmarking should be treated by House and Senate rules starting next year. You can tell that rhetoric and ideology are getting their way when House GOP leadership is telling the rank and file to cut their griping and just deal with it. It being a prohibition on all earmarking (writ broad). The thinking person should have problems with that. Putting aside an obvious constitutional argument, let’s consider how not all project types are alike. And to keep this short, let’s stipulate that while some earmarks are little more than grand ideas others have been subjected to considerable analysis. Put water resource projects in the latter category. Federal water projects go back to 1824 when Congress told the US Army Corps of Engineers to make rivers safe for navigation. Today the Corps’ civil works mission includes navigation (the Federal system of coastal and inland channels), protection against floods and shore erosion, and other project types. Today projects are put through an extensive and expensive series of wringers: environmental, engineering and economic analysis, EISs, White House sign-offs, reports to Congress, contracts between local project sponsors and the Federal government (covering sharing of costs, provision of lands, etc. ), congressional authorization of projects that satisfy the various tests (see WRDA), and subsequent funding decisions by Congress. Oh, and there’s the public input opportunities along the way as well as more recent provisions for “peer” review of Corps feasibility studies.